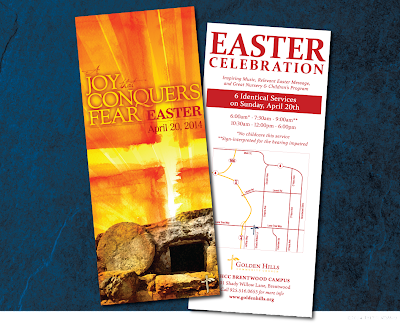 This is the Easter Flyer for Golden Hills Community Church's annual Easter services. I was asked to design a background that could be used to project on the screen that sits behind the whole stage for the Easter service and tie the print promotion with that design. I created this warm watercolor background of the sky with different tiled watercolor squares that I think will be a very vibrant and beautiful backdrop for the Easter services. The theme for Easter Sunday is A Joy that Conquers Fear. When I think of fear, I think of darkness. I really wanted the background to be bright and vibrant to dispel any thought of darkness or fear.